No fork and knife are required to eat them ! The only difference with the ones in the photo, taken two years ago when the recipe was originally posted in French, was that I didn’t have any shrimp to put in them. By the way, remember, you CAN find sulfite-free shrimp in the frozen section of your food store! To chop mint leaves, place inside a mug at a comfortable level for better control and cut with scissors. To use your measuring spoons, balance them over two even containers, such as shown below. It helps to have all the spoons in a bunch, rather than separate elements, because I was able to rest them over the side of the glass jar, blocking the whole lot. Use the Force, Luke 😄! 1. Cook rice vermicelli / noodles according to instructions on package. Drain and cut up into short strands. 2. Combine all dipping sauce ingredients and set aside. 3. Coarsely grate carrot. Even this can be done single-handed! I placed the grate inside a large enough pan placed at a comfortable level on a stool, blocked one end against my thigh and voilà! 4. Mix vermicelli, mint, carrot and shredded chicken. I don’t add salt at this point since the sauce will take care of that. 5. Soak one rice sheet in a pan full of very warm water, carefully remove from water when soft, spread out on a plate, and place the next wrapper to soak while you proceed. 6. If using shrimp, place two halves on softened rice sheet. 7. Place lettuce leaf towards the bottom of rice sheet. Add a small amount of filling. 8. Start rolling wrapper with lettuce leaf, somewhat tightly, in order to create a double lining for your roll. Fold left and right sides in, and finish rolling. 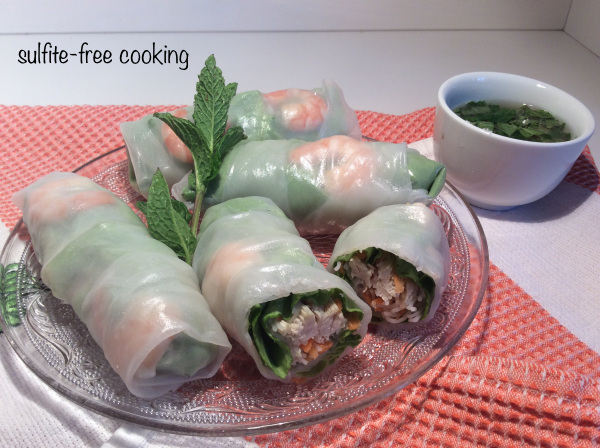 Keep on a slightly oiled plate, otherwise your spring rolls will cling to one another! Repeat steps 5 to 8 until all wrappers are filled. Of course, you can use whatever tickles your fancy for the filling: chopped peanuts, shredded kohlrabi, … Anything, provided the ingredients are safe for you, dear neighbors! Also note that you can make your rolls ahead but then will need to wrap them individually in plastic. These have no preservatives and do not keep for more than a day! Delicious recipe, and thank you for Harry Potter (always delightful! ), but I must have missed that post – what happened to your arm? Hi Dolly! It’s all explained in a previous post: last week, I fell off a wall (backwards!) while gardening… Very lucky: I only broke my left upper arm. In a sling (no cast, apparently they avoid that nowadays) so I am learning to do things with only my right arm. Good luck, Madame One-arm Bandit, and get well soon! Love the nickname 😄, thank you Dolly! In the U.S., that’s what they call casino slot machines. It implies that, even though you are operating with one arm, you are full of treasure! You make me laugh so much, Dolly! You too are a treasure! I hope you won’t mind me using two hands to applaud you and your ingenious tips as I still haven’t solved the riddle about the sound of one handed clapping. Take care neighbour and keep up the great work.